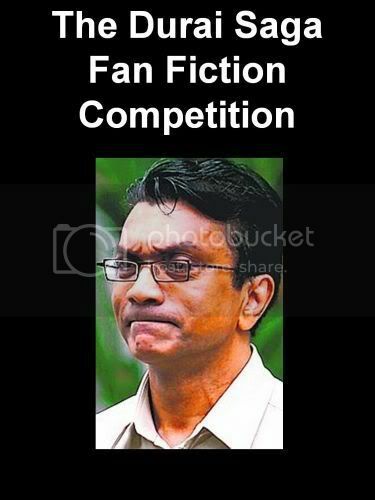 Participants in the competition write a fan fiction story based on the current Durai Saga, placing its anti-hero, former NKF chief executive T.T. Durai, in various fantasy situations that take place in an alternate universe that comes to an end with his trial. Responses have been overwhelming, though many Singaporeans display an expected lack of imagination. “We already have 300 entries titled some variant of ‘T.T. Durai and the Golden Faucet of Fire'”, claims Mr Chua. Entries range from serious action dramas such as “Durai: The Dark Organ of the State” to seriously incomprehensible melodramas such as “Lone Wolf Durai, Hotel Connoisseur”. Also received were light hearted parodies, satires, and sexually explicit Durai/ Shanmugam slash fan fiction. While the staff enjoyed reading many of the Singlish entries, they were deemed as unfit for publication in an English language newspaper and had to be burnt and exorcised in line with Speak Good English campaign regulations. The more outstanding entries are often imaginative and of high literary merit, and may someday look forward to being published in book form. Mr Gynaecology Gan, one of the participants, says that he enjoyed writing his entry and that in writing it, he has come to feel Singapore is much more exciting and mysterious than is commonly supposed. “In our very own country, we’ve had a jet setter’s magic fiefdom built up on diseased kidneys, mysteriously remaining out of view before finally materialising before our eyes. It’s magical,” he says. “I’m truly inspired to fantasise and share my visions of what else could be within our opaque exterior”. The competition will be judged by a selection of true Singapore ghost-writers for Russell Lee. Patter continues to accept submissions until 1 February, and will announce the results during the Chinese New Year holiday. Ultimately, Mr Chua hopes the competition will remind Singaporeans that issues of transparency and fairness are all secondary to the overriding need for a good, sensational story. “Our good system has persevered and triumphed over evil, and that’s enough,” he concludes. The above is totally satirical and should only be treated as such.